Wallace Quinn Managing Director John Quinn has succeeded in his quest to tackle Africa’s highest mountain. 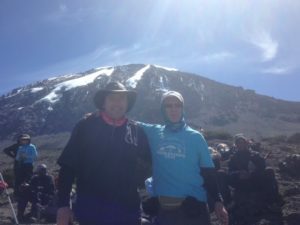 John reached the summit of Mount Kilimanjaro on 28th March, raising money for St Andrew’s Hospice in Airdrie through sponsorship. John’s trek to the summit started in the rainforest on the lower slopes before emerging through the clouds to a much more barren landscape. John was part of a team that took six days to conquer the mountain, mostly trekking but occasionally scrambling on all fours up steep rocky slopes. The summit of Kilimanjaro is 5895m above sea level, with oxygen levels at the top nearly half of what they are at the base. In 2019, we’re delighted that John pulled out all the stops and made it to the top! Does that mean a trip back to Kilimanjaro at some point in the future for John? If you would like to donate to John’s ‘Just Giving” page for St Andrew’s Hospice, click on this link. 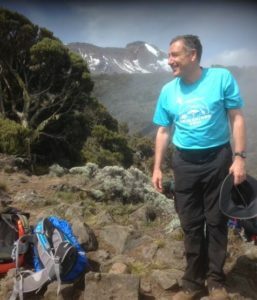 UPDATE: Our Managing Director John Quinn is off to settle a score with Kilimanjaro to raise more money for St Andrew’s Hospice. Read more and help him fundraise here. Wallace Quinn has long been a supporter of the St Andrew’s Hospice in Airdrie. For over thirty years the Hospice has been a hugely important resource for patients, families and carers across Lanarkshire. We’ve raised money through a variety of fundraising events and this month our Managing Director John Quinn visited the Hospice to present a cheque for £3600. 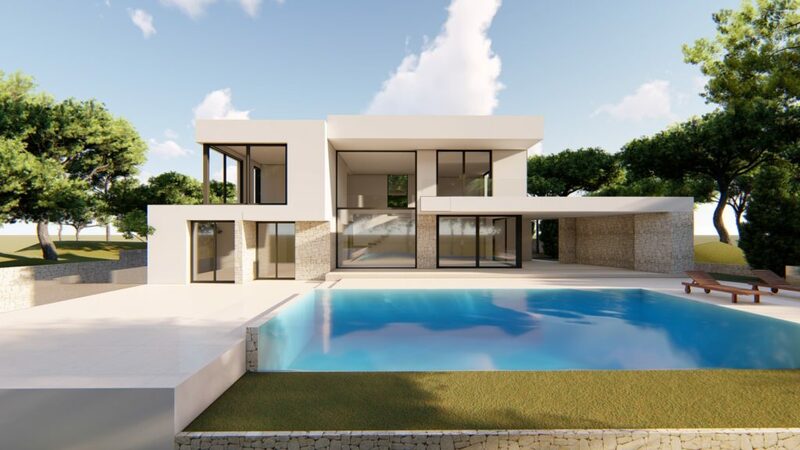 The money will go towards the Hospice’s ‘Capital Appeal’ – a £9 million pound programme to reconfigure and refurbish the hospice and make it fit for the future. For this latest event, Wallace Quinn hosted a golf day at Dullatar Golf Club in Cumbernauld. We invited our suppliers, clients and friends to enter teams of four. The winning team had a bit of a home advantage, as all of them are members at Dullator – Stuart McKie, Jim Marshall, Steven Freeburn and Jim Hamilton. The second placed team was from one of our suppliers, Professional Office Supplies, captained by Adrian McKenna. 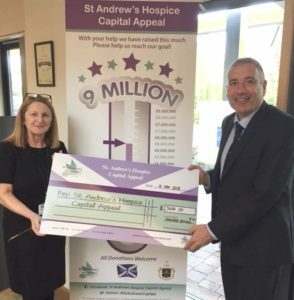 Well done to everybody for taking part and, as always, our deepest respect and admiration to all the staff and volunteers at St Andrew’s Hospice for their remarkable work. If you would like to find out how your business could help the Hospice with fundraising, then visit the website to find out more. 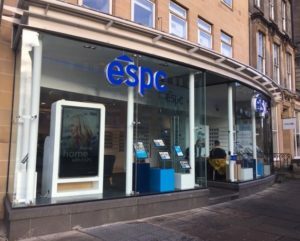 Wallace Quinn and Keys Estate Agents have announced an exciting new partnership which will create a one stop shop for property sales, marketing & conveyancing across the East End of Glasgow. Wallace Quinn have been serving clients across Glasgow since the law firm opened in 1990, offering a range of legal services across home life, work life and personal life – everything from Conveyancing to Wills and Powers of Attorney. 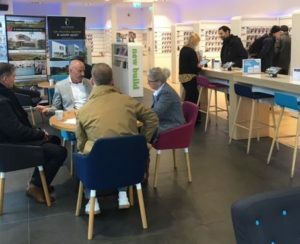 The new tie up will see both businesses remain independent, but combine resources to ensure fast, efficient and profitable property sales for clients. 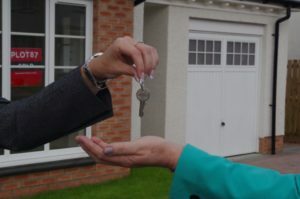 Wallace Quinn will concentrate on conveyancing – the legal process of buying and selling property – while Keys will concentrate on sales and marketing. 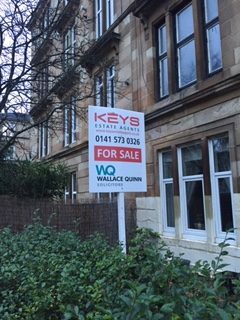 If you’re looking to sell a property in Glasgow, then contact Wallace Quinn or Keys Estate Agency on 0141 573 0326.